Kenneth A. "Ken" Kallenberg was born on April 27, 1918, in Calais, Maine, on the border with New Brunswick, Canada. 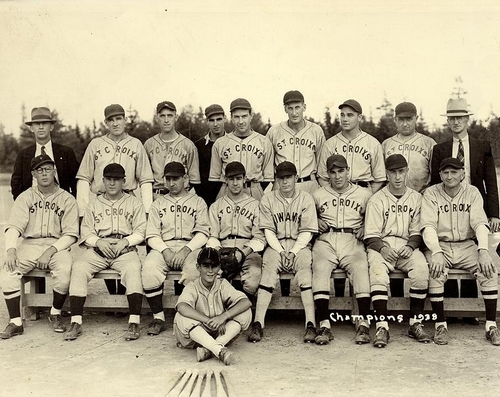 In 1935, aged 17, the right-handed pitcher went over the border to play baseball with St. Stephen Kiwanis team in the competitive New Brunswick League and continued to play in the league, mostly with St. Croixs, thru 1936. The following year, the Boston Red Sox showed an interest and he spent spring training with the Georgia-Florida League's Moultrie Packers, but was not able to earn a spot on their roster and returned to play with St. Croixs. In 1938, Kallenberg was picked up by the Boston Braves and put on their developmental program. He played in the Boston Park League and won his first game, 10-3, adding a double and a single. In four other starts, he lost just once. A bright future seemed to be ahead for the young hurler, but an arm injury sent him home to Calais, nursing a sore arm and he had bone chips removed from his elbow. He then rejoined the St. Croixs team, helping them to the 1938 Maritime championship title. In 1939, Kallenberg was signed by the New York Giants. He played for the Milford Giants of the Class D Eastern Shore League, and was 11-8 in 30 appearances with a 5.27 ERA. With a pitching staff that almost all had losing records, Kallenberg led the team in wins. He was back with Milford in 1940, and with future big leaguer Jim Gladd as his battery-mate, he posted a 16-7 record in 28 games with a 3.20, and tied for team wins with Warren Pickell and Howie DeMartini (DeMartini would later lose his life in military service in 1944). Kallenberg's promising baseball career was put on hold when military service beckoned in March 1941. But with the United States not at war, it was hoped he'd soon be back on the mound for the Giants. Everything changed on December 7, 1941, and Kallenberg was on his way to the Pacific to fight the Japanese. A Staff Sergeant and squad leader with K Company, 103rd Infantry Regiment, 43rd Infantry Division, he saw action at Guadalcanal, the Northern Solomon Islands, New Guinea and Luzon. He was awarded the Silver Star and Bronze Star, and was wounded in action three times, receiving the Purple Heart and two oak leaf clusters. After the war, Kallenberg returned to Calais, Maine. For the 27-year-old, his baseball career was a distant memory. He married Edie in 1947, and worked for the US Postal Service until retiring in 1972. Ken Kallenberg, ballplayer, wounded veteran and recipient of the Purple Heart with two oak leaf clusters, passed away on August 18, 2011, at the Maine Veterans Home, in Machias, aged 93. The St. Croixs team of 1938. Maritime champions. Ken Kallenberg is back row, seventh from left.